Friendly rooms possess wooden floors as well as traditional decoration consisting of forged metal lamps and paintings with motifs from the Altamira caves. The bedrooms, some with chimneys, are comfortable and offer beautiful pastoral and rural views. The Parador restaurant has a mix of international dishes and regional dishes on the menu. There is also a special gluten free menu. and the typical dessert "quesada pasiega". Santillana del Mar is one of the most beautiful and well-preserved villages in Spain. The town has a zoo and nearby are the Altamira Caves which contain one of the most celebrated examples of prehistoric paintings in the world. For some they are nicknamed the "Sixtine Chapel" of Prehistory. Enjoy the festivals of Santillana del Mar. On January 5th there is the Three Wise Men parade while June 28th is the feast of Santa Juliana. August 16th, is the Feast of San Roque. By car, explore the Cabarceno Natural Park and the route of the Cares river and you will also Experience the impressive views of the "Picos de Europa" (Peaks of Europe) mountains. Near Santillana del Mar, you may go caving, bungee-jumping, hang gliding, climbing, microlight aircraft flying, and canoeing. The Parador of Santillana Gil Blas is approximately 119 kms from Bilbao and the famous Guggenheim museum, designed by the American architect Frank O. Gehry. This Parador has fourteen twin bedded rooms, nine double bedded rooms, two single rooms and three suites. The Santillana Gil Blas Parador has heating, air conditioning, conference facilities, currency exchange, lift, free internet access in communal areas, garden, parking garage and parking facilities (without security and limited places), satellite television, a restaurant and a bar. Distance from the nearest airport is approximately 23 kms, train station is 8 kms away and the nearest port is 25 kms away. We stayed for two nights in June. 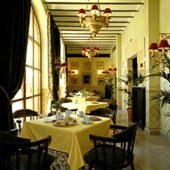 An excellent Parador full of charm with a very good breakfast; we also ate one evening there as well. The evening meal had good choices on the menu. 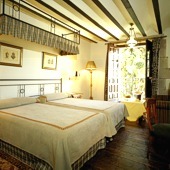 Our room was lovely with a separate sitting room and bedroom with a view over the courtyard at the back of the Parador. The staff were very helpful and we were able to leave our car in the car park (at the other Parador in Santillana) while we visited other places in the village on our last day. Like other visitors we had a little difficulty in finding the Parador when we arrived but that was only a minor problem. Stayed for two nights in May. Lovely ambience and old world charm. Initial problem of finding the hotel due to wrong name given to the square which should have been Plaza Mayor. Very friendly staff. The hotel's decor was appropriate and the town is beautiful. We would have liked more advice on other places to eat. We had a forgettable meal in the restaurant next door ! Breakfast in the hotel was very good but dinner was ordinary. We stayed one night at Parador Gil Blas at the end of October. We were arriving on the ferry from Portsmouth to Santander, which does not dock until 6pm, so we notified the Parador that we would not arrive until between 7 and 8pm. They acknowledged this information very promptly. We arrived at the village of Santillana del Mar soon after 7 pm, in the twilight, and at this point we encountered the only real problem - we could not find the Parador. With very limited Spanish, I eventually found a very helpful local (who did not speak English but kindly insisted on taking me by foot to the Parador, along the route which we would subsequently have to drive) and the problem was overcome. Reception were very helpful, and even gave me the unexpected option of a garage for the night, which I was pleased to accept as we had a lot of equipment in the car. The room, in addition to being very characterful, with a lovely view of the square outside, was clean and spacious, and I was particularly impressed with the magnificent landing, which looked like the great hall of a stately home! The restaurant was excellent, both for dinner and breakfast, and the stay was most enjoyable, although for only one night. Before we left the next morning we were able to go for a stroll around the magnificent medieval village in the heart of which the Parador is situated. 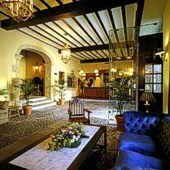 Parador hotel of Santillana Gil Blas is in beautiful old house in the town centre and now a National Monument.